Scientists have discovered that southern right whales, hunted to near extinction in the 19th century, appear to be re-colonising mainland New Zealand calving grounds from a remnant population in the subantarctic Auckland Islands. The endangered whales were rarely seen around mainland New Zealand for most of the last century, but small and growing numbers are slowly returning to the coast to give birth and raise their calves. “With the increase in numbers observed around the Auckland Islands over the last decade, we think that some individuals are re-discovering the former primary habitat around the mainland of New Zealand,” says Professor Scott Baker of The University of Auckland and Oregon State University, who helped initiate the first study of the Auckland Island population in 1995. The latest findings are based on genetic evidence from small skin samples collected from 707 whales over more than a decade. By comparing the DNA fingerprints of individual whales, the research has confirmed genetic differences between whales around Australia and New Zealand, and provides new insight into differences in the recovery of regional populations. The results support the conclusion that the mainland New Zealand population was wiped out and that the returning whales are from the remnant subantarctic population. It revealed, for the first time, the movement of seven individual whales between the Auckland Islands and mainland New Zealand. “The seven whales that have been identified in both the Auckland Islands and the mainland are probably the first pioneers of this re-colonisation,” says Dr Baker. The research has been published today in the international journal, Marine Ecology Progress Series, by scientists from The University of Auckland, New Zealand Department of Conversation (DOC), Australian Antarctic Division, Macquarie University, the Museum of Western Australia and Oregon State University. Maternal fidelity is a kind of cultural heritage passed from a mother to calf during the first year of life, as they migrate together from calving grounds to feeding grounds thought to be near the subantarctic convergences. When right whales around mainland New Zealand were wiped out, this heritage seemed to have been lost, slowing the return of whales to their former habitat. Surprisingly, a remnant population that calves in the subantarctic Auckland Islands survived and has shown signs of recovery, with surveys in the 1990s revealing an estimated 1,000 individuals. With increased numbers of southern right whales returning to the mainland shores, DOC is calling on the public to report sightings of this rare whale. “With the winter calving season upon us, we are once again calling for the public to immediately report sightings of southern right whales to 0800 DOCHOT” says Dr Laura Boren, the DOC National Marine Mammal Coordinator. DOC also has a flickr gallery where the public can upload images of the whales, at www.doc.govt.nz/marinemammalsightings. Dr Boren reminds photographers not to get too close to the whales, however. “To keep both you and the whale safe, leave a distance of 50m or 200m if there is a calf present,” she says. 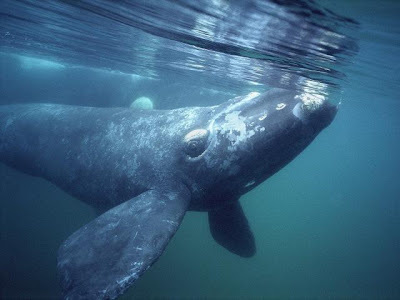 Southern right whales are large, long-lived mammals that calve in shallow coastal areas where they were hunted intensively in New Zealand and Australia in the 19th century. The species was given legal protection by the League of Nations in 1935 but was subject to illegal whaling in the 1950s and 1960s. The current New Zealand population is estimated to be less than 5 per cent of its pre-whaling abundance. It seems like New Zealand that is not the only places that this is happening. I read an article recently where there was a massive gathering of whale's the likes of which has never been seen before. Could this be reactivation of some genetic memory from long past of safe, fertile breeding grounds that have not long being cleared of the menace of men and returned to the whales. It would be spectacular to see these areas return to what they once were before mans genocidal intervention.